In densely populated metropolitan areas like Boston, car crashes are an unfortunate part of the daily routine. Approximately 400 people were killed in Boston crashes in 2016 alone, and thousands of collisions resulting in injuries occur here every year. One study by INRIX even named Boston one of the worst cities in the world for car crashes. If you were hurt or a loved one was killed in a Boston car accident caused by another’s negligence, we may be able to help you recover compensation for your injuries, property damage, lost wages, pain and suffering, and more. At Jason Stone Injury Lawyers, our attorneys can advise you on your legal options and fight for the financial security you need to move forward with your life. Call 800-577-5188 or contact us online to arrange your free consultation. Massachusetts follows a no-fault auto insurance system, meaning you will likely turn to your own no-fault car insurance policy to pay your initial medical bills. This is true regardless of who caused your crash. These first-party benefits should pay for your medical care up to the limits of your policy, usually $8,000.00. Insurance companies don’t play nice when it’s time to pay up following a traffic accident. Your insurance company may try to limit your medical benefits, or another driver’s insurer may attempt to deny a legitimate claim, leaving you and your family to fend for yourselves. If you were injured in a car accident, it’s a good idea to consult with an attorney before accepting an insurance company settlement offer. When it comes to insurance and car accidents, Massachusetts is a no-fault state, which means drivers carry personal injury protection (PIP) in addition to mandatory auto coverages like uninsured driver and property damage coverage. 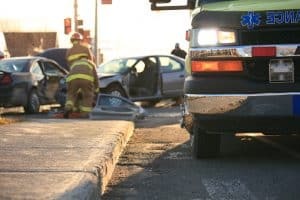 No-fault states differ from tort states in that most personal injury lawsuits are prohibited unless the accident and injuries meet specific criteria, called a tort threshold. Under Massachusetts law, a driver’s PIP policy covers up to $8,000 per person for related damages like medical care, lost wages and professional services. This amount, however, may not be enough to pay for a victim’s total losses or complete medical needs. At Jason Stone Injury lawyers, we can help you navigate the claims process and try to recover compensation for almost any type of car crash. We can investigate your case and help you understand your options for recovery. Additional compensation for pain and suffering and out-of-pocket expenses can only be recovered in Massachusetts if the accident and injury meet certain benchmarks. If injuries sustained in a collision result in the victim’s death, surviving family members can seek compensation through a wrongful death claim. 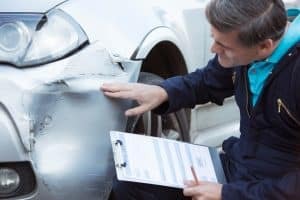 How is Fault Determined in Massachusetts Car Accidents? Just as all Massachusetts drivers are required to carry auto insurance, all drivers are expected to operate their vehicles with reasonable care. Failure to uphold this duty is considered negligent behavior. Massachusetts is a modified comparative-fault state, which means a victim can only recover damages if he or she is less than 50 percent at fault for an accident. Compensation is reduced according to what percent a person is determined to be at fault; If fault exceeds 50 percent, no compensation can be claimed. Fault is determined by insurance adjusters, who base their decisions on law enforcement reports, statements from those involved in the collision, and other available evidence. Liability, in many cases, is highly subjective. Car accidents often leave injury victims to cope with long-term medical costs, lost earnings and other damages. Document your crash-related expenses and losses. After receiving medical attention, one of the most important steps injury victims can take is to consult with a knowledgeable personal injury attorney. Under the Massachusetts statute of limitations, injury victims have three years to file a legal claim for damages. But the sooner you contact an attorney, the sooner your lawyer can investigate your case and preserve evidence to support your claim. Finally, don’t assume that you can’t afford a personal injury attorney if you feel you need one. Our lawyers offer free consultations to help you understand your rights and options, and we work on a contingent-fee basis, which means we only get paid after you get paid. When you have the Jason Stone Injury Lawyers legal team on your side, you can focus on getting back on your feet while we focus on recovering the compensation to which you are entitled. From our very first conversation, our team will go to work protecting your right to compensation, will give you peace of mind and will spend our time fighting for a full financial recovery. Our commitment to your well-being and satisfaction is summed up in our Stone Cold Guarantee®. Our attorneys are ready to do the heavy lifting so you can focus on getting better. We will stand by you through the entire process, helping you understand what to expect and updating you on the status of your case. We can often prove you qualify to hold the at-fault driver liable and settle these cases without resorting to filing a personal injury lawsuit. However, we will not hesitate to take your case to court if necessary to get the full range of damages to which you are entitled. If you were hurt or a family member was killed in a Boston-area car crash, you Better Phone Stone. For over ten years, our team of personal injury attorneys has focused on helping our clients get as much money as possible for the injuries they suffered. If you have questions about whether you have a valid case for recovering compensation, call our trusted injury lawyers at 800-577-5188 or reach out to us online today.